Really beautiful Andrei. I'd hang it on the wall. How big are these in the original? Thanks, Derik. As for the "original," there really isn't such a thing. I mean, the marks derive from my drawings (in this case, a 2-page spread from an 8 1/2 x 11 sketchbook), but they are so manipulated, recut and reassembled digitally that I think of the "original" drawings as just raw material. However, I am planning on printing them as pretty large inkjet prints (maybe 24" x 36"). I didn't realize they were digital! If you ever make large prints, I'd be interested in buying one. 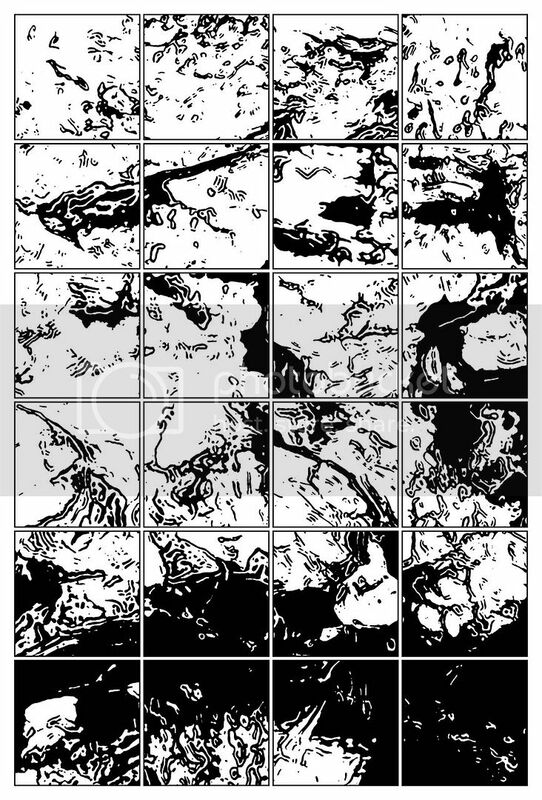 I've been thinking about doing something similar (large printout comics). In art school I used to use the giant copy machine at kinkos (I think it was for architectural plans) to make huge print outs (3' x 4'). It will take a while, probably, but I'll definitely let you know. I was also thinking of turning them into silkscreen prints--at that size, it might end up cheaper in the long run, especially since they're only one color. On the downside, I've never done silkscreens before, so I'd have to learn how to. But I imagine they might look really nice as silkscreens. Nice work Andrei! I can see so many faces in there! It's as exciting as it is haunting!